Westlake Village, CA: Malibu Graphics, 1990. Saddle-stapled magazine. Light shelfwear. Very good. 68 pp. Profusely illustrated with b/w drawings and stills from Manga and Japanese Animation series and films. 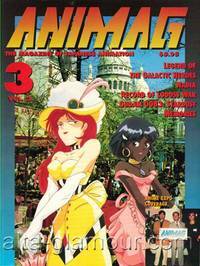 News, character bios, and feature articles about specific Manga.Report from Anime Expo '92. Nadia: The Secret of Blue Water, by Jenny Johnson and Mike Pondsmith. P.C. Joseph on Rendering Animation at U.S. Renditions. Record of Lodass War, part two. Legend of the Galactic Heroes, by Takayuki Karahashi. Stardust Memory: Mobile Suit Gundam 0083, by Julie Davis and Toshifumi Yoshida. Mold Making process, by Dana Kurtin. Mecha File: A continuing series on the mechanics & robots of Japanese Animation, compiled by Albert Wang.